For many travelers, El Nido's front yard of Bacuit Bay is what tropical paradise is all about. It is littered with gorgeous islands - those sharp, jagged peaks shooting like torpedoes to the skies. One earlier edition of Lonely Planet Philippines, written by western authors, even declared that El Nido "dare we say it, is better than Vietnam's Halong Bay and Thailand's Krabi". It was a statement that got me excited. Now that I finally made it to El Nido, I wanted of course to see what everyone else came here for. Fortunately, island-hopping in Bacuit Bay isn't a difficult proposition given how the process has been standardized. Every hostel, hotel, resort, and travel agency in town sells pretty much the same package with the same inclusions. There are four day tours simply named A, B, C & D, costing anywhere between PHP 700 to PHP 900 per person. Transport, guide and lunch are included. The most popular happens to be Tour A so I decided to go with the most popular. While Stunning Vistas where I stayed offered the same thing, I went to town and checked the well-established El Nido Boutique & Art Cafe. Finding that there was still a spot available for their trip leaving at 9 AM, I immediately signed up, paid PHP 200 for the Eco Tourism Development Fee, paid an extra 100 pesos for the mask (stingy me didn't want to pay for another 100 pesos for the fin which I will regret later) and found myself in the company of other visitors from Germany, France, Canada and the USA. There were 12 of us in all. It was a brilliant, sunny day in mid-March and soon everyone was talking not just about the weather but where everyone was from - a very typical backpacker ice breaker. We had a young guide and a skipper for the big outrigger boat that whisked us away from one island to the next. For the next 7 hours or so, our Tour A brought us to 7 Commando Beach, Big Lagoon, Secret Lagoon & Small Lagoon in Miniloc island, Simisu island for snorkeling and lastly, to Ipil Beach. The jaw-dropping Big Lagoon is undoubtedly the most iconic of all that El Nido is usually remembered for. I had to pinch myself to realize where I was - and remembered how envious I was of other friends I knew that made it there before me. I even remembered as a teenager ogling at a photo of the very same spot featured on an old Philippine encyclopedia at home and secretly wished I had the wherewithal to go there someday! So happy to finally tick off one from my bucket list. What makes the islands also a draw for many visitors are the plentiful secluded white sand beaches. The sand may not be exactly like Boracay but the tranquil atmosphere is way better than having to deal with a crowd and the resulting noise. There's even an option for anyone who want to play it up a la Cast Away (without talking to a Mr. Wilson necessarily) - all it takes is just hiring a banca to any island and be picked up at a pre-arranged time or even a pre-arranged day! We went to one secluded cove in Miniloc island where lunch was prepared by the guide and the boat captain. Nothing fanciful but still gratifying - we feasted on grilled fish and pork barbecue. There was even ice cold San Miguel beer for 50 pesos. After lunch, everyone but me went for a sun-bathing mode (I'm naturally tanned already so I think the other travelers knew why I hid under the palm trees like any other Pinoy would have done!). All I wanted to do at that point was just relax and enjoy the view. So pretty (isn't that an understatement?) is the view that even Hollywood came to shoot in Bacuit bay. The "Bourne Legacy" movie recently shot some scenes in El Nido. Film location manager Dow Griffith was so impressed he called El Nido a "paradise" while actress Rachel Weisz was famously quoted as saying "I can live in Palawan forever!". Even if Matt Damon didn't reprise his role, now I know I've got something to watch in the theater this August! Sadly, not everything is as good as it should be in this paradise. We snorkeled at the Big Lagoon and soon realized there's something amiss. While it's gorgeous above water, the view down below is abruptly different. There were hardly any corals left, most of them have died, withered and bleached for various reasons: cyanide fishing, dynamite fishing, strong typhoons, El Niño or something new I only learned that day, a sea tormentor called the Crown of Thorns. Snorkeling off Simisu island was no different either. This was where most tour boats were anchored for the snorkeling part of the tour. It was disappointing to see dead corals or what was left of them. With less corals, there were also less fish to see. The current was so strong I could hardly keep myself moving away too far from the banca while desperately trying to look for Nemo down below. I so regretted not renting the flippers as I now have to work doubly hard in order for me not to be pushed away to South China Sea! Will someone please get me out of here? 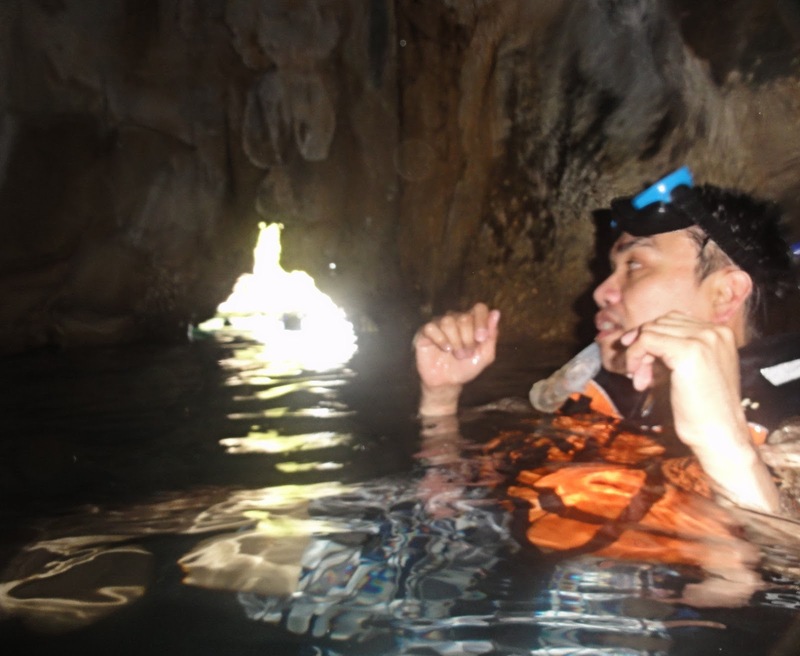 On another side of Miniloc island, we snorkeled into Small Lagoon by swimming through a narrow opening on the limestone karst. The water wasn't clear - or I guess all the sediments turned into a cloud as we swam by - and since I was the only one without a fin, everyone else got ahead of me. Our guide led us into this small subterranean cave, lit naturally from a crack above while we floated aimlessly in the deep water. I found it creepy, imagining weird creatures that might suddenly grab me from under! Snorkeling back into our banca without fins was of course another ordeal for me. Though my arms were sore, my thoughts went back to the sorry state of marine life in this beautiful bay. I asked the guide what was being done. There's an ongoing drive, he says, to combat the Crown of Thorns infestation. As for the other causes, he wasn't even sure. El Niño and typhoons are something else but cyanide and dynamite fishing? I do hope they do more than just address this issue of a coral-eating starfish. A lot of work needs to be done. 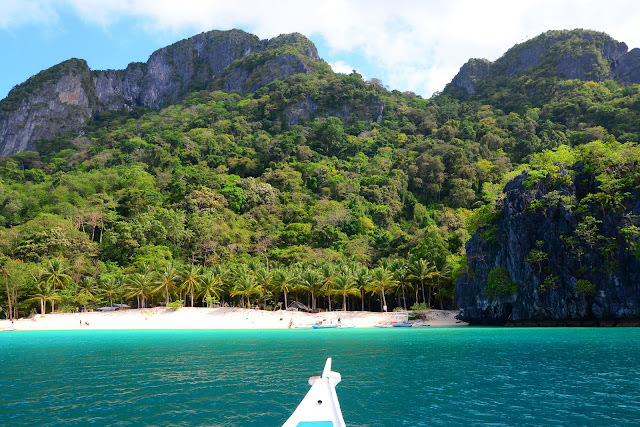 El Nido is paradise worth saving. if i could only go to one spot in the philippines this would be it. i'm really envious, even though i cannot swim, i'd be satisfied with just looking and getting my feet wet. Excited to visit El Nido! Thanks for sharing and making me crave to go there soon. You are living the good life, with or without your flippers. Btw, is the government doing anything to protect the corals? Probably not, they can't vote. "...ogling at a photo of the very same spot featured on an old Philippine encyclopedia.."
--> that must have been ages ago, encyclopedia pa e! hehe! it's always inspiring to know someone's living his dreams and with no direct intentions, motivating others like me who, like you before, have been hoping to set foot in those breathtaking spots the world has to offer. no pressures in chasing those dreams; we have various priorities. what is important is you know how to live life happily with a purpose. those package tours are a steal!if my memory serves me right, i already read similar costing at dom's eskapo post. i'm not sure if we'll get a chance to visit palawan someday but if and when we do, i'll definitely swing back to this series and dom's too. Wow 1998, that's been a long time! It would be good if you can return and see for yourself the changes. I have a feeling you'll love El Nido - just not sure how you'd feel about the 5-hour bus ride. For me, it's really worth the long trip. Glad this motivated you more to visit El Nido. Thanks for visiting. haha - while corals are living things, it's only up to us humans to protect them. Sadly, that wasn't the case until things really got bad. yesss, that encyclopedia is actually gathering dust at my parent's home in Davao - who's still reading them I don't know haha! I agree, there's no need to be pressured to go - your time will come. Most of these places I've been to were aspirational destinations - am so thankful to God for making them come true! Hello! How much yung rate ni Brian for tour A? Tour A cost the same @ PHP 700. You might be interested in adding on a kayak to this tour, just ask around or at El Nido Boutique & Art Cafe.